Danau Gunung Tujuh At about 2000 meters (6,400 ft.) Danau Gunung Tujuh is the highest lake in Southeast Asia. Being part of the Kerinci-Seblat National Park, untouched virgin rainforest covers its shores and is home to tapir, sun bear, tigers, deer, gibbons, and countless birds. 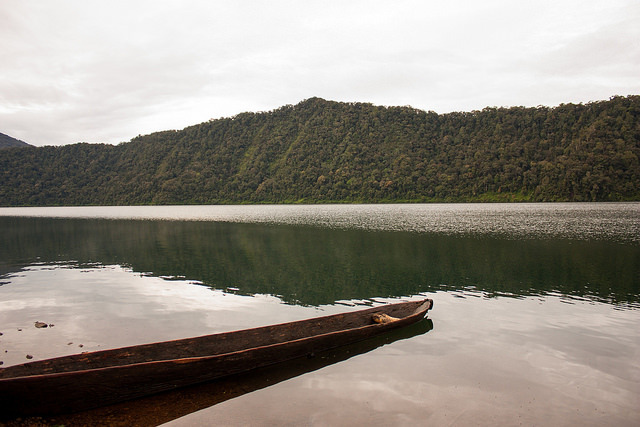 Gunung Tujuh is a massive, extinct volcano whose eruption in ancient times blew apart the top of the mountain, eventually forming a large, 4.5 km long lake in the crater left behind. Being completely within the Kerinci Seblat National Park, the surrounding peaks (of which there are 7 – hence the name “Tujuh” in Indonesian), are covered in primary rainforest, and home to a wide variety of birds and wildlife. Supposedly, the lake, at around 2000 meters, is the highest in Southeast Asia. Being up there, with the clouds clinging to the primeval forests all around, it truly feels like you’ve stepped into a prehistoric lost world. The trek up to the lake takes approximately three hours, plus or minus an hour depending on your level of fitness, and how much time you take to slow down and notice the environment around you. It’s a fairly strenuous hike (no switchbacks in Indonesia), with the tree roots forming a type of staircase in places. Once at the lake, its possible to take a 1.5-2 hour canoe ride to the other side (Pasir Putih), to camp(based on canoe availability). Or you can walk a short distance around the left side of the lake to camp at a closer spot. Other options if arranged ahead of time could be to take our trail camera to set up along a trail, and after dark, take a night walk or canoe ride out on the lake using flashlights to try to spot wildlife. Wake up in the morning to the beautiful song of the Siamang gibbons as they echo throughout the caldera. There are a number of options for exploring from your camp at Pasir Putih. If arranged ahead of time, you could choose to follow the shore line with the canoe, looking for birds and wildlife. You could cross to the south side of the volcano and find game trails to follow. You could head into the forests and swampy areas around Pasir Putih. Or you could choose to climb up some of the surrounding mountains, particularly the nearby Gunung Kecil. Keep an eye out for Nepenthes pitcher plants – there are a number of endemic species only found on Mt. Tujuh. Don’t forget to take a night walk or canoe ride in the evening to try and spot nocturnal creatures. After enjoying the sunrise and a little morning exploration along the trails or out on the canoe if available, head back across the lake and down the mountain. Conditions: The trek up can be a bit challenging if you’re carrying too much or trying to go too quickly. At the top the temperature can be a bit chilly, especially during the night, so bring a jacket or enough clothing to layer. Best to avoid times of extended rain, but, as it sits within a tropical rainforest, be prepared for it. Don’t forget to apply sunscreen when you’re on the lake – being so close to the equator it’s easy to burn quickly, especially when the air is deceptively cool. Price includes a local guide and porter, transport within Kerinci to and from the trail head, permits, all food and equipment. Price per person reduced with more than two travelers, but usually limited to a max of four people to lessen the impact on the environment.